I currently have an exhibit at the Bradford Washburn American Mountaineering Museum in Golden, Colorado. I will be giving a talk at the museum on September 21st as part of Bentgate’s Ski Season Kick Off Party. I will have books on hand and the prints from the exhibit will be on sale. The fun begins at 6 PM. If you can’t make it to the big party I will be signing some books and chatting with people at Tattered Cover Book Store in Littleton on September 19th, 7pm. Babel Tower and the South Buttress reflected in a pond. 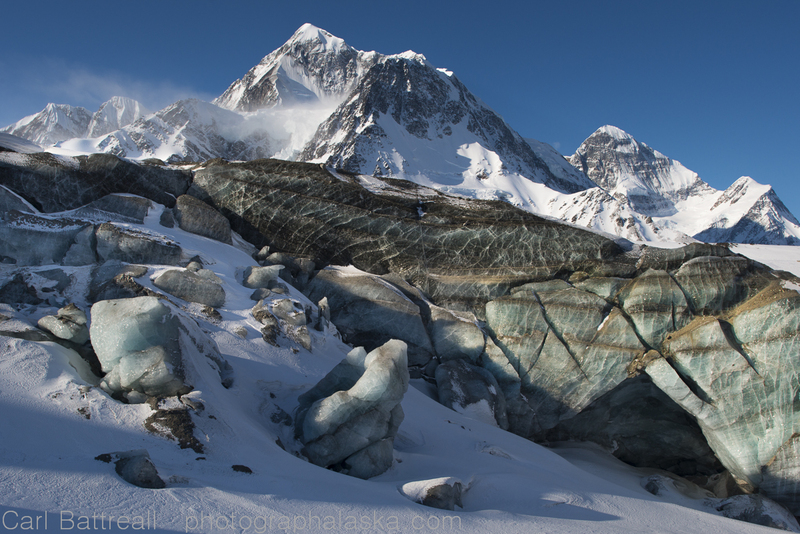 Here are some links to recent stories and portfolios on the Alaska Range book and project. Mountain magazine’s deep winter issue has a great 5 page portfolio, if you can still find a copy! I know that for many people, 2016 has been full of loss and disappointment. I have also felt frustrated, discouraged and saddened by the passing of many wonderful individuals and by the constant news of the destruction and suffering of so many innocent people, wild creatures and wild places. However, my despair has been lessened by the amazing support everyone has had for my Alaska Range book. Beginning with the mind blowing Bear Tooth book launch party, which was sold out and had over 400 people in attendance. Even my best friend and frequent mountain companion Sy, couldn’t get in to the party! Since that event, the book has been selling like crazy. Anchorage has been sold out for weeks. I have had trouble keeping it in stock myself. At one point, the book was #33,000 on Amazon. Doesn’t sound too great? But that was out of over 8,000,000 books available! Not too bad for a photo book of the Alaska Range. Speaking of Amazon, if you have time to write a review on their site, please do! There is plenty of Alaska Range goodness scheduled for next year. Big features in publications like Mountain magazine, Sierra and Escapism (UK). My solo exhibit at the Bradford Washburn American Mountaineering Museum, in Golden, Colorado begins in September and I will be there to give a presentation. Some of the Alaska Range prints will be in the National Parks a of Alaska and Hawaii exhibit at the G2 Gallery in Santa Monica. Of course, my eyes are set on 2017 Banff Book Festival! The 4th annual Denali Wilderness Photography Workshop will take place in June. This is the one and only back-country photography workshop-tour in Denali. So if you want to get away from the crowds and buses, come join me the wilderness! I will also be doing my usual courses at the Anchorage Museum, with some new classes coming, including one in January. The most common question I have been getting is, What’s Next? That is a tough question. I have been doing more assignment work, both as a writer and photographer. I am also looking at doing more teaching. I have trips to Cuba and Africa coming up in 2017. My primary website www.photographalaska.com has been revamped and a new blog is in the works (which will be linked to that site). I know, that doesn’t answer the question. I do have some new projects boiling up, but your just going to have to be patient! Thanks again for all your support. Wishing everyone a kind and compassionate new year! Join me on Monday, November 28th, 5:30pm, at the Bear Tooth Theater, for a grand celebration of the Alaska Range. I, along with Legendary adventurer Roman Dial, visionary alpinist Clint Helander will be some exciting giving presentations. There is a $4 cover charge, which will be donated to the Alaska Mountain Rescue Group. And don’t forget to order your book, they are shipping now! Fed Ex delivered two advanced copies of my upcoming Alaska Range book to the door today. It was exciting and a little scary seeing the first printed copies. I have also been working hard printing the 150 limited edition prints that go with the special edition. I will admit that I am glad that I am printing these via a modern ink printer instead of an old “traditional” process like Ilfochrome. Printing hundreds of prints of the same image in a color analog darkroom was quite labor intensive and honestly, would often drive me near the brink of insanity! I have sold about 1/3 of the copies of the special edition book/print set. You can pre-order your own copy or a copy of the retail version on the order books page. Limited edition version. Only 150 copies will be printed! Super excited to reveal the limited edition version of the book. Only 150 copies of this version will be printed and they are going fast! This book also comes with the print, Middle Triple Peak, 2015. This image will only be available with the book. Once the edition is sold out, the image will be retired, never to be printed again! If you want one of these awesome collector books, consider pre-ordering one. Many of them have already been purchased (through our Kickstarter campaign and directly from me). I cannot guarantee any will be left when the book becomes available in late October. Middle Triple Peak.This is the image that comes with the Limited Edition book. Only 150 copies of the book and this image will be printed, then this image will be retired, never to be printed again! 11×17 image on 13×19 paper. Printed by Carl on archival, cotton paper. 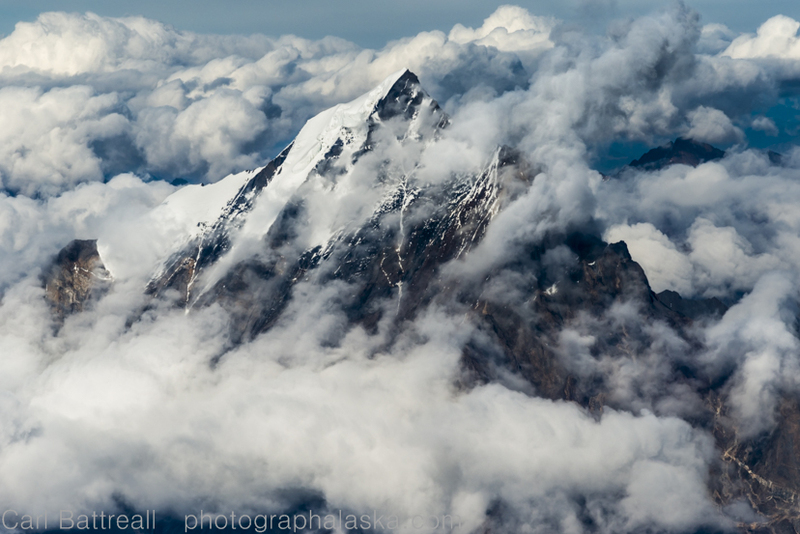 Alaska Range book update and Denali National Park Photo Workshop. First, I must apologize for the lack of activity. Its been a busy winter, but not a lot of action outside in the mountains. Still trying to recover from my hip injury that occurred over a year ago. Fortunately, being injured has allowed me to focus on getting the book details complete. We are in the final stages of the process. All the essays are complete and edited. layout is complete and I just sent off my high resolution copies of the final photographs. We will have one more thorough review, looking for any missed issues before it is sent off to get printed! The Mountaineers Books feels confident the book will be in stores and into YOUR hands in October. Mark your calendars for the big book launch party November 28th at the Bear Tooth Theater, it is going to be a ton of fun! There isn’t a cluster of mountains in the Alaska Range that holds as much mystery and intrigue as the Revelation Mountains. When I look up the statistics for this site, the most popular search term is”Revelation Mountains”. And yet with so much interest, there is very little information about this mighty anchor of granite spires at the far western corner of the Alaska Range. My first visit to the Revelation Mountains was in June of 2006. Six of us did a long backpack along the western edge, over rolling tundra and below towering monoliths. It was one of the best backpacking trips I have done in Alaska, rivaling the mighty Arrigetch Peaks in the Brooks Range. In 2006, beta about the range was completely vacant. The only written information I could find was in old American Alpine Journals. The most prominent entry was the legendary 1967 Harvard Mountaineering Club expedition. The six members, which included David Roberts and Alaskan Art Davidson, spent 52 days struggling up peaks and enduring mind boggling bad weather. Many of the named peaks like: The Angel, South Buttress and Golgotha, that appear on USGS maps, can be attributed to that expedition. I learned early on that the Babel Tower, which is south of, the South Buttress, had obviously used its power of “confusion of tongues” and totally scrambled the mind’s of the map designers. The names on the maps are all mixed up. The 1:63 maps are correct but the 1:250 maps are completely off. The unclimbed west face of the Angel. Yes that perfect coulior has not been climbed or skied. It was, however, descended in the dark by Clint and partner after the peak’s second ascent. In 2008, the young Alaskan alpinist, Clint Helander, made his first expedition into the Revelations, making a bold first ascent. He has climbed in the range every year since. Clint has become the guru of Revelations climbing and the Revelation Mountains recent surged in popularity can be directly linked to his many, wild exploits. If you have questions about climbing in the Revelations, he is the man. The area’s remoteness has contributed to its mystery. Access to the range is difficult and expensive. The range is also unfriendly to visitors. The terrain in very rough, glaciers are broken and littered with debris, rivers are milky, swift and cold, the alders are relentless and plentiful. For non-climbers, the only pleasurable terrain, is along the perimeter of the range, especially the west side. The backpacking there is superb, on easy tundra, with lots of wild critters. We enjoyed sharing the landscapes with bears, caribou and countless ground squirrels. The Sled Pass area has some limited options, it is a beautiful spot, but you quickly get “cliffed” out or must endure endless, character building bush-whacks. Pack-rafts have been used to escape the endless bushes. The far north side looks promising, but access is unknown, and so are the mountains there. If you are looking to truly disappear in Alaska’s mountains, the north end of the Revelations is the place, you just have to get there. The heart of the Revelation Mountains is a place for experienced mountaineers, many of which, have been completely crushed by the mountains there. Summer access is either by float-plane (if your going to backpack along the west side), Super Cub on tundra tires or the almighty helicopter (TAT has one now!). If your climbing, you want to go in winter or early spring, when there is plenty of ice plastered to the crappy rock. Ski landings are possible on the majority of the glaciers, until mid-May or so. The Amazing Mount Hesperus being engulfed by clouds, Revelation Mountains. If the thought of travelling in one of Alaska’s most remote and pristine mountain regions intrigues and terrifies you, you could consider going on a guided trip with Alaska Alpine Adventures, the only backpacking guide service with real experience in the Revelations Mountains. Amazing ice and Mount Hess and Deborah. Thanks to everyone for all your support, it was an amazing process. The video was played 988 times. I have made my initial selection of 200 images that has been sent to the Mountaineers Books. They have begun the layout and design process and will make their initial selection of images. I will visit them in Seattle in a few weeks where I will help with the final image selection and also give my input on the design and layout. From there we will continue to hammer through design ideas, ruthlessly edit the essays and work on the maps. I will make the final tweaks on the selected images. When we have all agreed on a book we all love, it will be sent to the printers. We will get a proof first, this is how we will catch any typos, design issues and poorly reproduced images. Once the proof is approved the book will get printed, bound and sent to The Mountaineers Books distribution center in Seattle. This process will take many months. We plan to see the book on the shelves late summer, 2016. This is when we will ship all the books to the backers of the Kickstarter campaign. This blog/website will be getting an over haul. Don’t worry, it will not go dormant. There are plenty of peak profiles and images to share, along with photography and wilderness tips. Once the book is printed, this blog/site will be the center of all the action, letting you know about upcoming lectures, exhibits, book signings, workshops and hopefully reviews and awards! So if you want to stay in the loop, follow the blog! Thanks again for all your support and for making this long over due tribute to the Alaska Range a reality. The photographs are finished, the essays have been written and the designers over at Mountaineers Books are busy working on the layout. We now need to raise the final funds needed to get this book out to the world! We have started a Kickstarter campaign and need your help in spreading the word. I am offering tons of great rewards including: copies of the retail book, prints, an awesome limited edition print-book set and even a backpacking trip in one of my favorite places, the Delta Mountains of the Alaska Range! 10/30 – 24 Hours to Go! 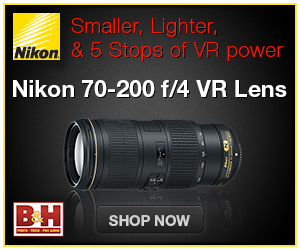 We are at 160%, totally amazing! can we get to 200%? 10/5 – We Did It: We Past Our Minimum Goal! Not only did we reach our minimum goal of $9,000, we rocketed right by it! The book will be published! I can’t express how grateful I am for everyone’s support. In five days we raised over $9,000 for the project and we have 25 more days to go! So lets keep the good vibe going. We are not being greedy, we can use every cent we can get. First we can use the extra money to cover the Kickstarter fee, which is between 8-10% of the total. Then we will use extra money to cover costs of the rewards. After that, it all goes to the book. We can print more of them, increase its distribution (hopefully to Europe) and if we raise a lot more, increase the physical size. So thank you for making this long over-due celebration of the Alaska Range come to life!